Eclectus Information (Personality, Care, Diet) ... Eclectus Species ... Eclectus Sub-species Identification ... Talking Ability (compared to other species) ... Common Diseases / Conditions of the Eclectus Parrot. 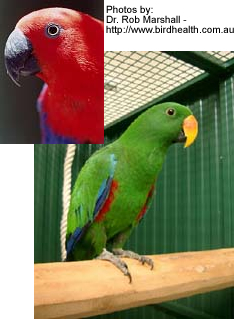 There are only a few Biaki Eclectus parrots that were imported into the US in the early 1990s. They are not commonly available and little is known of their breeding habits. Although they are likely to be similar to those of the nominate form - the red-sided eclectus. The Biaki Eclectus parrot is often described in some literature as being a controversial subspecies. Experts working with both the Biaki and Solomon Islands Eclectus, however, agree there is a definable difference. They both are similar is size. Adult Biak Red-sided Eclectus Parrots are about 13.5 inches (between 32 and 35 centimeters) in length. Their wingspan is about 9 inches (215 - 245 millimeters). They average 375 –425 gm in weight. The male Biak Red-sided Eclectus Parrot is green over most of his body; except the underwings and sides under the wing, which are red. The upper side of the male's tail is green and tip of the tail feathers are yellow. The underside of the tail is black with a defined yellowish pale edging to the underside of its tail (¼ inch).. The iris is a reddish orange. The Biaki Red-sided hen is similar to the nominate, adult red-sided hen except the red coloring on the neck and bib is brighter, and she is much smaller than the red-sided hen. The female Biak Red-sided Eclectus Parrots are red with blue under wing coverts. Their primary coverts are blue with a green edge. Her tail is lighter reddish-orange underneath with a defined yellowish pale edging to the underside of its tail (¼ inch).. Their irides (= plural of iris) are a light, yellow-white color. The females have red heads and chests. Her shiny black beak appears slightly smaller in proportion to her head. Her feathers are held very tightly to the body in comparison to many of the larger subspecies. Not common and unknown in the United States.